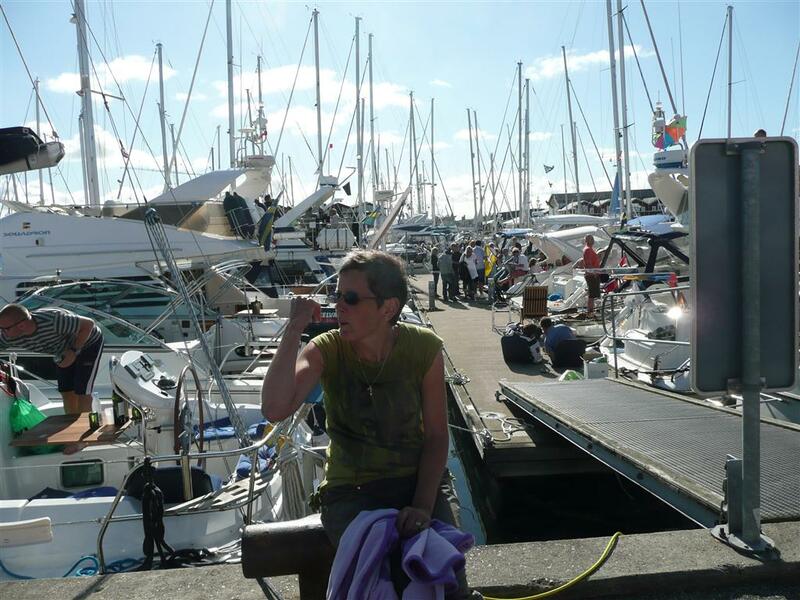 Week 4 – Heide (DE) to Hirtshals (DK) – Do your dream! Week 4 started with rain, which according to the forecast is set in for the week. Amazing – we go away in August for 2 years in succession and get soaked both times (2009 – Scotland flooded!). Tip 1 – don’t follow us if you want good weather. Our journey continued north and we stopped in Husum. The outskirts of the town was a dump and we almost just drove through. We did stop though and found the old town was pleasant enough and much better than Heide, but not good enough to justify getting soaked for. So we thought we’d continue north and head into Denmark. To be fair, the western side of the Schleswig-Holstein part of Germany is very rural and not outstanding enough to be memorable in our trip as a whole – though we didn’t touch the coast due to the weather. 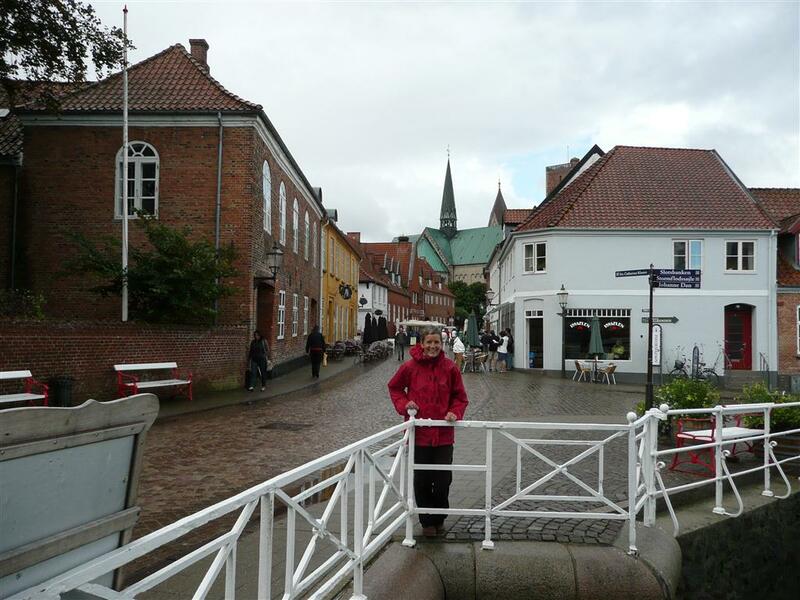 Tonder was nice enough and we probably didn’t do it justice at all, but it was very wet so we decided just to give up and headed to an Aire in Ribe and chill waiting for the weather to pass. And the rain came, followed by wind, followed by rain. Typical November storms (in August). In a brief lull we ventured into RIbe (Denmarks oldest town) and it looked quite nice and definitely worth a longer tour. As it started raining again we headed back to the van and battened down the hatches till the morning, good job too as the wind and rain got stronger and the van was rocking all night – nothing to do with Matt this time. As we had access to fresh water we had a decent hot shower then went into Ribe in glorious sunshine. Within minutes nature gave us another shower and the bizarre cycle continued. 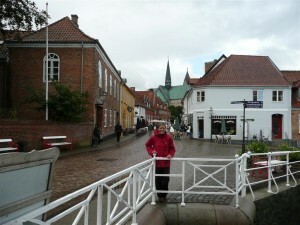 Ribe is a lovely place to look around though and we can imagine in the summer sun it would be ideal for beers and food. There is also a Viking museum which, we think, we have been to previously on a mini cruise to Denmark. We decided to head to the coast to see if the skies were clear there, so we set off towards Oksby Denmarks most westerly point. I mean – surely it won’t be as windy and wet there next to the North Sea…?! As we headed west the roads became quieter and the views, though flat, became a nice mix of woodland and heather salt meadows, all rather pretty. The roads appeared to give many a beautiful wild camping opportunity. Oksby looked like just a tourist town filled with tourists in parker coats and mountain gear, and the lighthouse was there just about withstanding the wind. So yep, windy, but no rain and it stayed rain free for the rest of the day. Our next stop was to see the Blabjerg Klitplantag which is a 68m tall moving dune. Despite our best efforts we never found it so assumed it had blown away completely. Giving in we headed then to Nymindegab beach which was almost impossible to get to as the wind was funnelled into a walkway you had to fight through, though once there we were surprised to see still intact WW2 fortifications. Finally we headed towards Falen and Borkhaven to wildcamp for the night. 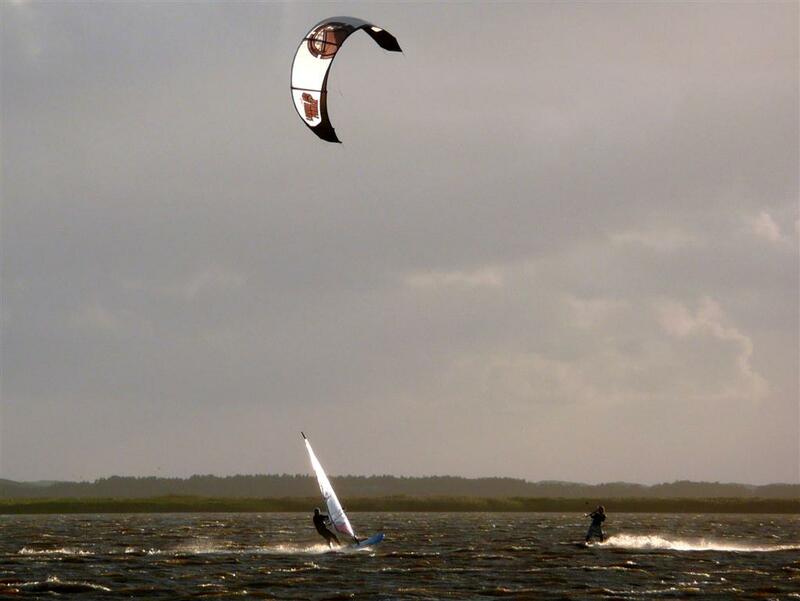 Here, there is the Ringkøbing Fjord which is perfect for windsurfing and kitesurfing, the windsurfers were really motoring along! 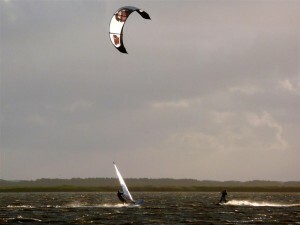 I enquired about some kite-surfing lessons to finish my course and was told it was too windy for lessons so all courses were cancelled. Due to our proximity to the windy sea for the day the van was covered in salt and sand such that we can’t see out of the mirrors. Where is the rain when you need it?! After tea an evening stroll took us back to the Fjord and we watched the kite and wind surfers having fun, we then settled in for the night. Well, I say settled, as about 3am the van was rocking and the wind was extreme to say the least – suffice to say we were kept awake so spent the day rather grumpy. I blame those big fan things we keep seeing around. First we went to Tarm where we’ve seen advertised a big and bustling market with loads of local produce and stalls. So having arrived in quiet Tarm and walked around the town (twice in 15 mins) it took us ages to find this great spectacle. When we did it was more of a small car-boot sale! I think we need to get out of west London mentality on terms of scale! From there we headed to Torsminde which is a “pretty gateway town” to Nissum Fjord according to our guide. It was actually barron wind-swept and empty vilage. Then to Struer (okay) and Holstebro which is a small modern city but they have placed lots of weird art around making it quite interesting. We found somewhere quiet and sheltered to stay to ensure we had a good nights kip. The following morning we ventured to Skive, quite an apt name our friends tell us, though surprisingly we didn’t live up to the namesake today as opposite the tourist information is a laundrette, so we did a load of washing. Conveniently there was a carpark opposite with some open wifi giving us time to catch up on internet life. Skive was okay to look around but nothing compared to Viborg where we went after. Viborg has a lovely centre and 2 lakes at the bottom of the hill. With no wind (they must’ve listened and turned the fans off) and hot sun it was almost beach weather as we explored and found a lovely wild-camping spot right on the lake. Lovely place, well worth a visit, one of those nice finds that make random touring fun! After pigging out on a nice ice cream we decided to run around both lakes in the morning (6.5 miles) in windless glorious sunshine and then had a nice breakfast on the lakeside before a good hot shower. Campervanning as it should be. Leaving Viborg we were on a water hunt as our tank was low, so headed towards Aalborg where there was supposed to be some – however we opted to avoid the tap we found at it was grim. Aalborg itself was fairly disappointing, a few okay to see bits, bit really didn’t find anything special. Typical city which looked fairly modern without much old character left. Moving on we headed towards Tars where our book said there was free motorhome services. Great – so we got there, filled up and emptied waste, then noticed it was 7€ to stay the night. 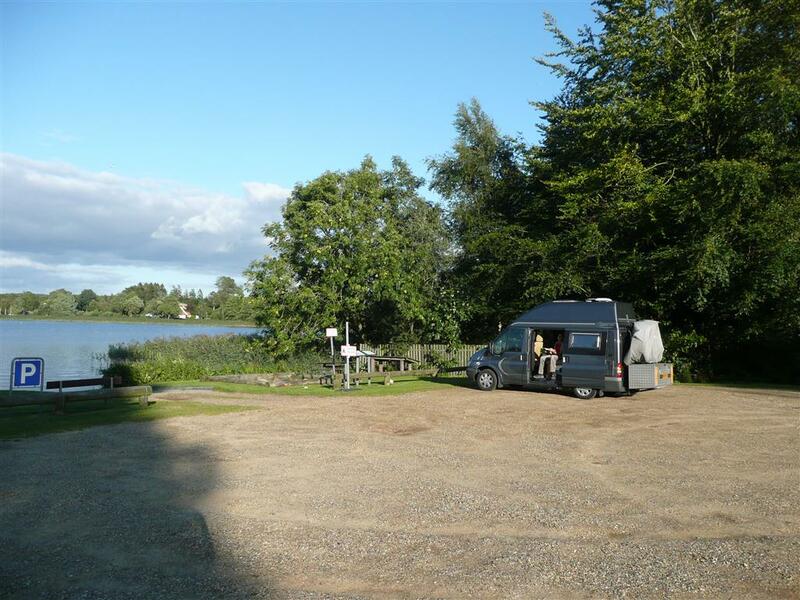 (Honest – it was in that order, Your Honour), so we continued our journey and got to Hirtshals on the coast where we wild camped with a couple of other vans. Whilst Hirtshals is modern, there is a busy square late at night which had some live music that was, well, iffy but funny, but we had a lovely sunset over the beach. In the morning we headed further north to the tip of Denmark, a place called Grenen just north of Skagen. Here you can walk right to the end of a sand spur and be the furthest person north in Denmark and have a foot in two different seas. The western sea (Skagerrak) was quite choppy whereas the eastern sea (Kattegat) was calm, so where they met was total confusion with waves in different directions. Weird. After seeing the WW2 bunkers we headed back to Skagen which was a total surprise. The place was absolutely packed ready for a music festival (of sorts) in the evening in the Marina. Pretty much every bar was packed and everyone was drunk and all the boats were full of playboys and blonds. And this was around lunchtime! We decided to head off on a bike ride to “Den Tilsandede Kirke” which is, according to the book, “an ancient church buried by a sand dune and only the tower remains”. We were expecting just the tip of the spire, but actually the entire tower remains and whilst the church is missing it was demolished and in effect the dunes hardly touch the building at all. Someone was obviously desperate when they invented the attraction! However the cycle ride through the dunes was nice and we headed to Højen on the opposite side of the spit which was a lot windier and quieter than Skagen. Skagen is famed for its very pretty yellow/orange fishermans cottages which were really pretty and the roofs with white paint made them look quite something in the sunshine. After heading back to the marina and listening to some ropy folk karaoke standard singing we decided to have a nap ready for the evening party. Feeling refreshed we went back out and saw some more local music being played in the bars and the town must be the party capital of this part of Denmark – Mel described it as a meat market!! The forecast for the next day was poor so we headed back to Hirtshals where there was a massive aquarium – the North Sea museum. We went in and it was actually well worth a visit and quite impressive though a bit pricey at £16pp. The main tank with shoals of fish and some quite ugly sun fish was stunning. We decided to stay there the night and finish our 4th week and first in Denmark with a meal in a restaurant we eyed up a few days earlier. The meal was okay but does show how expensive it is to eat out in Denmark!